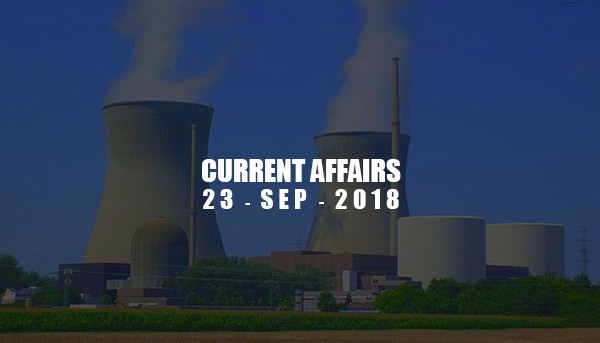 Current Affairs - Sep 23, 2018 - IAS - Daily Current Affairs, IAS Syllabus Exam Strategy, IAS Preparation. Prime Minister Shri Narendra Modi launched the Ayushman Bharat - Pradhan Mantri Jan Arogya Yojana (PMJAY) at Ranchi, Jharkhand, on September 23, 2018. Under this scheme, over 10 crore families (i.e. 50 crore people), the poorest 40% of India’s population will be provided with health assurance every year. A list of 1,350 procedures across 23 specializations, including pre- and post-hospitalization, diagnostics, and medicines have been prepared along with their rates for the scheme. A cadre of frontline health service professionals called Pradhan Mantri Aarogya Mitras (PMAMs) are being trained to facilitate the provision of treatment to beneficiaries at hospitals. Two units of Pressurised heavy water reactors in Kakrapur Atomic Power station recently attained 'criticality', that means now they have attained self-sustaining nuclear fission chain reaction in the reactor (a good thing). Two years ago, KAPS-1 automatically shut down due to a leak of heavy coolant water, leaving both reactors non-operational. Kakrapar Atomic Power Station has total four units divided into KAPS-1 (two units of 220 MW reactors) and KAPS-2 (two units of 700 MW reactors); these went critical for the first time in 1992 and 1993 respectively. India secured its place in the final match of 10th Asia Cup Cricket 2018 (ODI). It became confirmed after India defeated Pakistan and Afghanistan's defeat by Bangladesh. Now India will play with the winner of Pakistan vs Bangladesh in final. Variable Energy Cyclotron Centre (VECC) is now India's biggest cyclotron facility after starting its operations last week, it houses the machine, Cyclotron-30. VECC is under the Department of Atomic Energy (DAE) which is directly under the Prime Minister of India. What is Cyclotron? An apparatus in which charged atomic and subatomic particles are accelerated by an alternating electric field while following an outward spiral or circular path in a magnetic field. This cyclotron facility will produce radioisotopes vital for diagnosis and treatment of cancer. At present, many radioisotopes are imported while some are produced in Bhabha Atomic Research Centre (BARC) and remaining in cyclotrons facilities run by private hospitals. Kenyan runner and Olympic champion Eliud Kipchoge has set a new world record, winning the Berlin marathon in 2 hours, 1 minute and 39 seconds. He broke the record of Kenyan Dennis Kimetto by 1 minute and 18 seconds. The first General Assembly of the International Solar Alliance, ISA, will be inaugurated on the 2nd of October in New Delhi. The Kerala Veterinary and Animal Sciences University (KVASU) has set up a flightless bird research center. The center has been set up on the university campus at Pookode in Wayanad district.